In the infinite realm of inflatable paddle boards, it became harder to spot out the ones that are actually appropriate for specific activities such as Yoga. Nevertheless, there are still a few specs that separate a standard paddle board from a yoga one and that is exactly what we’re looking for today. In today’s post, we are going to discover the open world SUP”ing and Yoga. However, to make it easier for you to make up your mind, we’re going to boil our list down to the 8 best paddle boards for yoga on the market as of now. So, let’s get right to it. It is actually rather familiar to see an ISLE board on the top of this list since it is actually one of the leading specialists in inflatable paddle boards. 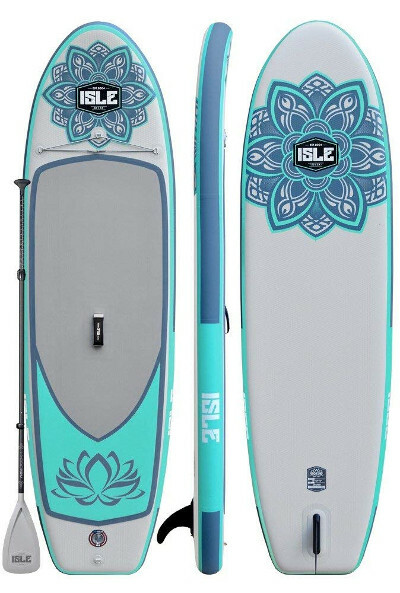 Indeed, with a solid reputation, ISLE smoked the competition and has made what could be the best inflatable paddle board for yoga. To put it a little more in context, the Lotus is one of the brand’s most versatile paddle boards as it measures a wholesome 10 feet in length which is perfect for most people. Also, to push the board further towards the yoga zone, the company decided to go with 32 inches in width in order to make the board as stable as physically possible. Further, the Lotus is also extra thick & at 6 inches, it’s pretty much a hulk that is capable of carrying a maximum load of 240 pounds.Now that it’s perfectly clear that the Lotus has the core characteristics of a yoga board, our only concern left is quality. Quality is often a frowned upon discussion when it comes to inflatable things in general but ISLE has been over that stereotype. This board is strictly made out of military grade PVC material, which is the same material that zodiacs, river rafts, and some bulletproof vests are made of. It is further enhanced via an industrial drop stitch construction that pulls the hull together tightly, leaving no room for chance. Nonetheless, what really makes this board great for yoga? Well, that would be the features. Indeed, the Lotus exhibits a set of impressive little features that will make your paddling and yoga experience a lot more enjoyable. First, the board comes with an extended gripping pad that will help you fit your body tightly on the board and reduce the risk of falling off. The board also features a holistic body art, which induces spirituality and calmness. Moreover, the board comes with a central carry handle to help you move it individually once inflated. Lastly, it features a tiny cargo net on the nose to help you secure your paddle, shoes or even clothes. In conclusion, the Lotus is a well-rounded yoga paddle board that is stable, responsive, and versatile. 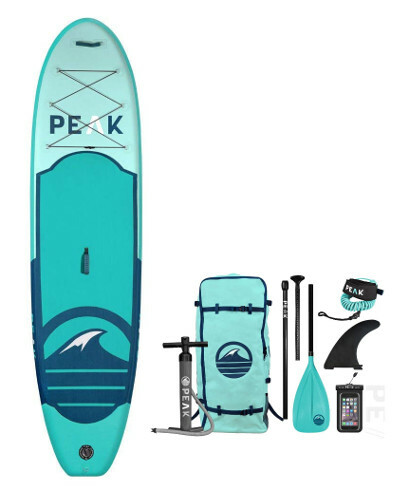 Peak paddle boards is one of the top-rated inflatable paddle boards manufacturers out there. 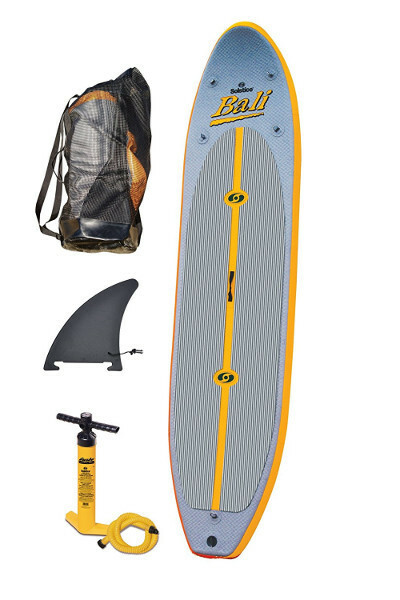 Their 10’6″ iSUP is one of the best selling inflatable paddle boards out there. This versatile iSUP was designed to appeal to different types of paddlers. So, does this still make a solid yoga board? Let’s find out. There are a few criteria that determine the yoga-bility of an inflatable paddle board and it starts with measurements. Indeed, the size of a board can say a lot about its purpose and the category of paddlers it targets. Hence, this Peak iSUP measures a solid 10 feet 6 inches in length, making it a perfect match for most paddlers. Moreover, the board strikes a sweet ratio in width as it measures exactly 31 inches, making it more stable, less bouncy and great for relaxation activities. As far as thickness goes, the Peak does not disappoint as it stands tall at the 6 inches mark which enables it to handle a maximum weight limit of 300 pounds. 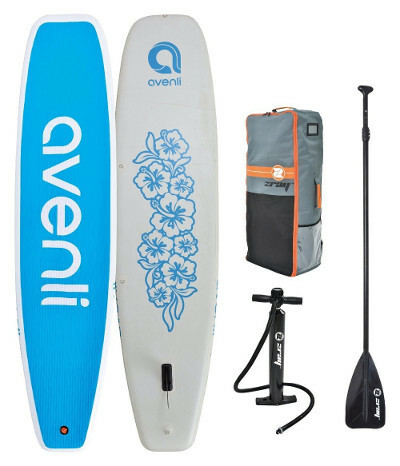 Once quality is taken down, the next thing which determines whether this is the best inflatable paddle board for yoga or not has got to be quality. Indeed, like all Peak paddle boards boards out there, the Peak is no distinction as it is made out of the toughest PVC material which will eliminate the possibility of punctures or dents and relieve you from constant worry. Additionally, the Peak is enhanced via an industrial drop stitch construction that leaves no room for accidents to happen. A splendid gripping pad covering half of the board to grant the paddler a firmer grip and stability on the board. Also, unlike the Lotus, the Peak actually features a larger cargo net which will enable you to hold down and secure pretty much anything your soul desires. The board even comes with a set of carry handles to enable you to transport the board on land individually or with someone’s help. 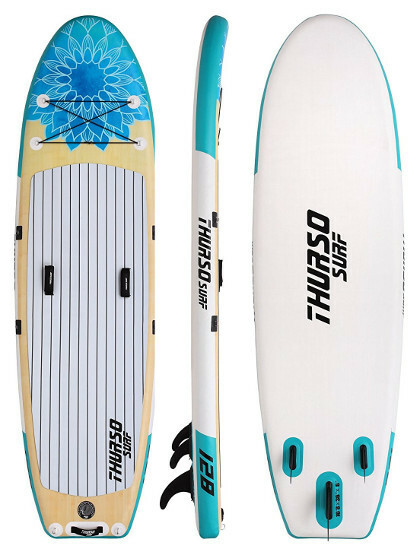 Swimline Solstice Bali is another great paddle board to consider. It’s specifically designed for yoga lovers and one of many traits. First things first, measurements is always our primary concern here because it always helps us determine what kind of board this really is. Hence, in length, the Solstice Bali measures a surprisingly good 10 feet & 8 inches, which is perfect for adult paddlers and especially the ones who love yoga. In width, the Solstice Bali measures a standard 30.5 inches, making the board as stable as possible while reducing the possibility of falling off significantly. Lastly, the Solstice Bali measures a rather humble 4 inches in thickness, which still adds up to around 220 pounds as maximum load. To compensate for its thin thickness, Swimline decided to make this iSUP a little stronger than usual by adopting the durable 1000 denier 3 ply PVC reinforced fabric material, which means that there is absolutely no way to permanently damage this board unless if that’s what you want. Also, the board is reinforced via the standard industrial drop-stitch construction that makes a great yoga board. A splendid anti-slipping pad that covers pretty much the entirety of the board’s surface, granting you all the stability in the world. Even with such a pad, the board still finds a place to allocate to a cargo net, which is often if not always used to secure anything you don’t want to leave at bay. To make transportation easier, the board hooks you up with a central carry handle that’ll enable you to carry the board individually. A carry bag to help you store or transport the whole thing at ease. BONUS Pumped Up SUP Pressure Gauge. Perhaps the most expensive paddle board on this list, the Activ is a strong competitor for those of you who are looking for a premium quality yoga iSUP. Hence, first things first, when we talk about a RED Paddle Co paddle board, the first thing that needs to be discussed is the MSL technology which constitutes its quality. Indeed, this board is a literal beast that will endure the toughest environments without a risk of puncture or deflation because of its quadruple-layer rails with a second layer rail type. To break that sentence down, the Activ is virtually indestructible unless if you run it over with a tank. Further, to complete the fantastic build, this board is finished with a high-pressure laminated heat-pressed seam that makes it 100% secure. Back to measurements. 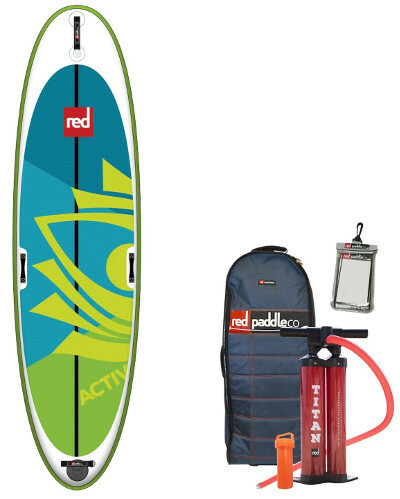 The Red Paddle Co Activ might be the toughest inflatable paddle board on this list but that doesn’t finalize your decision, measurements do. Accordingly, this yoga iSUP board at hand measures around 10 feet 8 inches in length which is fantastic for adult paddlers. Also, the board stands at an astounding 34 inches in width, making it perhaps the most stable paddle board on water and thereby perfect for yoga poses. Finally, thickness remains as one of its strengths as it hits the 6 inches mark, making it capable of handling up to 300 pounds. Furthermore, the features of the Activ are a dead giveaway that this board was made to appeal to yoga lovers. The first thing you spot on the board has got to be the endless gripping pad that will enable you to balance yourself and move properly on the board with every move you take. Further, the board features a beautiful spiritual design to keep you in a sheltered mood and away from distractions. Then there is the diverse carry handles to enable you to transport the board on land individually as easily as possible. 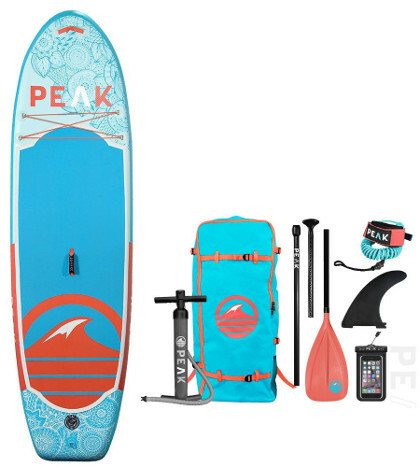 Peak Paddle Boards has proven over and over again that it can make great inflatable paddle boards but this board is the cherry on top of the cake. Indeed, Peak 10′ Yoga Fitness iSUP board is a sublime creation by the brand with one purpose and that is to embody the needs and requirements of yoga lovers and enthusiasts. Speaking of size, the board at hand is perhaps the most well fitted iSUP on the market as it directly targets adult paddlers with its 10 feet of length. Also, the board exhibits great balance and stability thanks to its 32 inches wide platform. Lastly, Peak Paddle Boards can’t really mess with this equation by flunking the last dimension. Hence, the Yoga and Fitness comes at a fulfilling 6 inches in thickness, allowing this board to handle up to 275 pounds. One cannot speak of thickness without gazing over at the quality of a board. Hence, the Peak Paddle Boards knows it has a lot to prove to yoga lovers here which is why they decided to go with a full double layer military grade PVC hull, which is the same material that zodiacs, river rafts and some bulletproof vests are made of. Nonetheless, no board is truly complete without drop-stitch construction which is why this board is finished with an industrial drop stitch construction that pulls the hull nicely together, leaving no room for leaks, damage …etc. Like most Peak Paddle boards, the Yoga Fitness is simply a masterpiece. In terms of design there is really so little to criticise about the board and so much to behold as it exhibits smooth edges, beautiful design and soothing colour schemes. One of the board’s most important features needs to be the gripping pad that will help you remain stable and fixated during your routines. Also, the Peak comes with a nifty cargo net that can be used to secure your shoes, paddle or anything that you can’t leave at bay. Lastly, one of the most underrated features of the board is the carry handles, which will enable you to carry the board on land easily and most importantly individually. A large carry bag to fit all of the above. 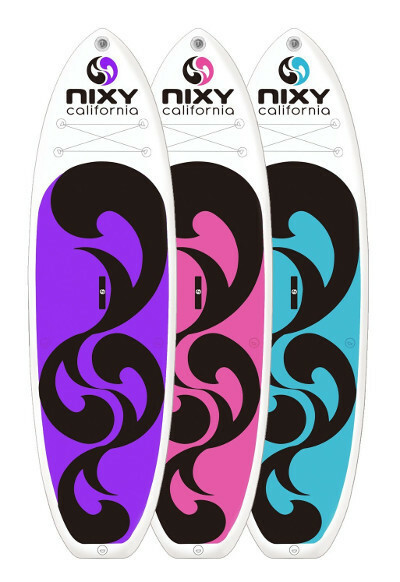 When we talk about inflatable paddle boards, there are a few brands which pop up in mind and Nixy isn’t exactly on that list. Nixy is thus an upcoming iSUP brand with a lot of apparent potential in the niche of Yoga and fitness. Hence, does that make the Nixy Venice Yoga board a viable contender for this type of list? Let’s figure that out! First things first, measurements can be either a blessing or a curse for inflatable boards and that is something Nixy is perfectly aware of. Hence, in attempt to make the best inflatable paddle board for yoga, the brand goes for a subtle 10 feet 6 inches in length which is a great fit for young adult and adult paddlers. Then, to give the board the stability and accessibility it needs for yoga, the brand goes for a strong 34 inches in width. Lastly, thickness has always been a strong dimension, which is why they went with 6 inches to ensure that the board is strong enough to handle a max load of 400 pounds. From that we jump down to quality which is a critical axis in the template of any inflatable paddle board. Indeed, the first concern that you have as a paddler have is quality and rightfully so since you’re buying an inflatable product after all. Hence, the brand thought it’d be only reasonable to go for advanced fusion technology which incorporates military grade PVC toughness and a industrial drop stitch construction finish. Beyond its mystic colour scheme, the Nixy Venice offers an impressive set of features that makes it evident that this is indeed a Yoga paddle board. It features a serene gripping pad which will play a major role in keeping you fixated on the board as you move around during practice. Also, the Nixy sports a subtle cargo net on board to help you secure anything you need with you on the board through your routines. Then there is the nifty little central carry handle which will enable you to carry the board individually on land. A back pack to fit all of the above plus the board. Thurso Surf is another great manufacturer of quality inflatable paddle boards. The Tranquility is one of the best Yoga inflatable paddle boards that Thurso Surf has to offer. It’s a synthesis of their experiences, knowledge, and history in one board which already grants it more potential to be your favorite on this list. Nonetheless, it is always important to look at the facts before you make up your mind about a board and the Tranquility should be no exception as the smallest change in its dimensions can affect its entire target audience. Speaking of dimensions, the board at hand is perhaps the most dedicated yoga board out there as it sports great features and perfect dimensions. Accordingly, the Tranquility Yoga stands at a substantial 10 feet 8 inches in length which is indicative of two targeted groups of paddlers, being young adults and adults. Then the board goes on to confirm its stability and yoga accessibility via a 34 inches wide platform. Finally, to wrap things up, Thurso Surf found made the board 6 inches in thickness, which is solid on most standards. In terms of quality, the board at hand is exemplary as it features a double layer military grade PVC coatings on the deck and sides, plus two layers of tarpauling coats added on top. The board is further reinforced via an industrial drop stitch construction that will keep the hull from coming apart under any circumstance. One of the most attractive things about the Thurso Surf Tranquility must be its design since it looks so harmless and inviting because of the body art and smooth edges. As far as features are concerned, Tranquility features a large gripping pad that will come in extremely handy for yoga practice when you’ll need to be fixated and balanced on the board during your routine. It also has a nifty cargo net to help you secure your personal items on the go. Lastly, the iSUP at hand actually comes with 4 rings around the pad to help you install a kayak seat when needed. Usually you can tell a yoga board just by reading its name but it is rather the difference for the Z-Ray at hand because you can tell simply by looking at it. Indeed, the Z-Ray Avenli Yoga iSUP at hand totally gives away its purpose by its shape and that’s actually a good thing if you’re a yoga lover. To elaborate on that last point, we’ll need to discover the measurements of the board first. Hence, in terms of length, the Z-Ray Avenli Yoga board measures a splendid 11 feet, which is the perfect match for adult paddlers & yoga lovers. To round it up, there must be a certain equilibrium between length and width and that is why the board comes at 32 inches, making it a stable platform for yoga and meditation . Then, to wrap things up, the Z-Ray Avenli Yoga comes with a solid 6 inches in thickness to help the board stay tough and cater for paddlers at a max weight of 300 pounds. We cannot talk of rigidity without going over the board’s construction as it has a lot in store for you. Indeed, this might just be another great option for yoga because it is built out of heavy gauge mesh PVC to ensure airtight performance. The board also features an additional side rail PVC layer that enhances board control and stability and to call it a day, the Z-Ray finishes up with an industrial drop stitch construction that pulls the hull tightly together, leaving no room for damage. Beyond the fact that this board just looks like a yoga temple on water, the Z-Ray Avenli Yoga iSUP actually has a lot of features to show off and impress you. Starting from the top of the chart, the board features a genius EVA pad gripping foam, covering the entire platform of the board to keep you balanced and at ease throughout your routines. Also, the board offers a few rings on the bottom of the board to be used for shoulder straps or simply to secure/tow the board. Last but not least, the Z-Ray Avenli Yoga comes in a complete, all inclusive package.